We Now Know A Lot More About Students Who Receive Federal College Grants : NPR Ed Several new reports offer insight on how well colleges and universities are serving their low-income students. Two recent reports offer a good snapshot as to what's happening for these students when it comes to college. One is from researchers at The Pell Institute for the Study of Opportunity in Higher Education and Penn AHEAD at the University of Pennsylvania. The other is from the centrist Democratic think tank Third Way. How do we even know who these students are? Millions of low-income students apply for Pell Grants — need-based, free money from the federal government. When students fill out the FAFSA, their income, family makeup and other factors can make them Pell-eligible — and they're awarded money for school. About three-quarters of Pell students come from families with incomes below $40,000, so often researchers (and journalists) will use this group of students to represent low-income students. The average award is about $3,700, and the most a student can receive per year is now $6,095 (raised for the 2018-2019 award year). Students are able to receive Pell money for 12 semesters — or the equivalent of about six years. For years, we had no clear sense of how well these students were doing. The federal government — despite spending billions on the program — didn't collect graduation information. All that changed last fall, when the Education Department released data on first-time, full-time Pell recipients. That's the data in these new reports. It's important to note, however, that this data ignores transfer students and part-time students. Data on those Pell students will be released this fall. So what do the reports show? It's not an even playing field out there. "I think people have the impression that Pell grants are taking care of low-income students' needs, and nothing could be further from the truth," says Maggie Cahalan, director of the Pell Institute and an author on their Indicators report. In the 1980s, a student awarded the maximum Pell Grant was able to pay for about two-thirds of average college costs. In 2016-17, the maximum Pell Grant covered 25 percent of average college costs. There's a major wealth gap when it comes to higher education in America. For-profit colleges, community colleges and two-year public programs often have higher percentages of Pell-eligible students. At four-year institutions with competitive admissions, the percentage is much lower. How do they do when they get to campus? After six years, fewer than half of first-time, full-time Pell recipients receive a bachelors degree at the school where they first enrolled. (Again, this doesn't account for students who transfer and finish elsewhere. That data isn't available yet). At for-profit schools, just 1 in 5 first-time, full-time Pell students graduates in six years. The gap between Pell and non-Pell students is also pretty astounding: Nationally, Pell students graduate at a rate of 18 percentage points less than their peers, 49 percent vs. 67 percent. 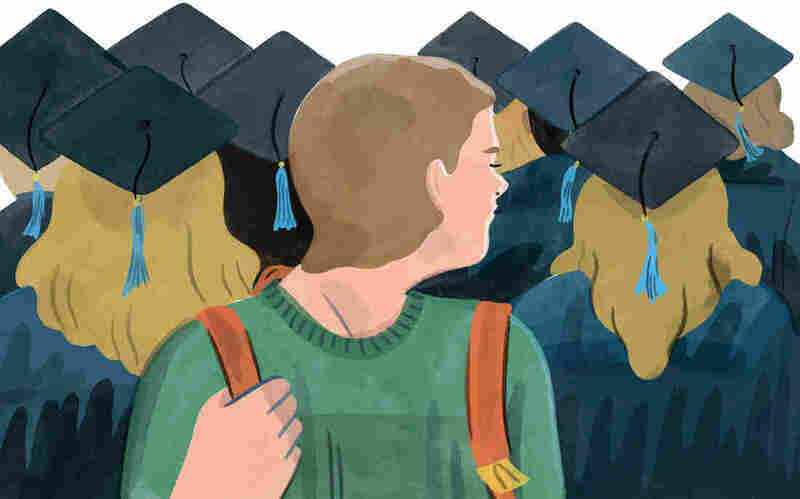 "We already have a completion crisis in higher ed," explains Tamara Hiler, one of the report authors at Third Way, "but it's even more acute when it comes to low-income and moderate-income students, who actually need the benefit of college the most." Some school systems have been able to buck this trend: of the 1,566 institutions studied, 242 reported higher grad rates for their Pell students. The University of California system is a good example, with UCLA, UC San Diego and UC Irvine leading the way. UCLA boasts an 88 percent graduation rate for its Pell recipients, and 85 percent of Pell students graduate from UC San Diego and UC Irvine. Other schools have a long way to go. A goal of the research is to enable students to use this information to make decisions about which schools can actually help them get a degree. And that, the researchers say, would help taxpayers know that federal grant money is being spent wisely. "We want to be directing Pell students about where to go to college," says Hiler, "they need to have information that's relevant to them. How well is a student like me going to do at this school, rather than just looking at institutional averages."